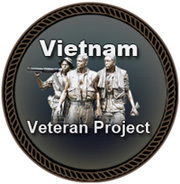 The Virtual Wall has memorial pages honoring the 58,300 women and men who are named on “The Wall”, the Vietnam Veterans Memorial in Washington, DC, USA; those military persons who gave the “ultimate sacrifice” for their country. The Vietnam Veterans Memorial in Washington was built from private donations collected by the Vietnam Veterans Memorial Fund. The Wall was dedicated in 1982, and completed in 1984 with the addition of the “Three Servicemen Statue.” Since its completion, The Vietnam Veterans Memorial in Washington has belonged to the people of the United States of America and has been maintained by the U. S. National Park Service. This web site is not affiliated with the US NPS. On The Virtual Wall, visitors may leave tributes, letters, poems, photos, and other memorials to someone named on The Wall for other visitors to view. The goal is to provide an environment like The Wall itself, with the dignity and respect those named on The Wall have earned. There are no flashy or noisy distractions, no commercials, no fee to publish a memorial, and no hand held out for donations.